Lewis Hamilton (1st): "This has been a great year and I'm so thankful for so many things - for my health, for my team, for all the hard work everyone's done non-stop at the factory and on the road. I also want to say thank you to all the fans who've saved up and travelled and came to the races and those supporting us from home and who've been sending their positive energies and their prayers - a big, big thank you to everyone. This year has been a very uplifting experience for me. I wanted to come here and make sure that I left no stone unturned; the team did an exceptional job all year long, so I really wanted to deliver for them and end the season off strong. I think I was able to do that and I'm really grateful for all the support throughout the entire year. I've been able to be a better me all year long and I will continue to try to work on that and try to work on the energy that I'm projecting to people. I had a lot of fun in the car today - I love driving, I loved driving every minute today and I hope I have many more days to go." Valtteri Bottas (5th): "It would have been nice to have a better ending to the season, but this race probably sums up the year pretty well - it started off well but then it went downhill from there. Everything felt pretty good in the beginning of the race, but then I had a lockup into Turn 5 and Turn 8 and lost some ground. I was struggling with the brakes and I also had a slow puncture after I my contact with Max, so I had to pit a second time. Max and I touched, it was proper battle and hard racing, but it was all fair. The last laps after the pit stop felt pretty long because I knew I couldn't gain any positions. This season didn't go the way I had hoped, so I'm actually quite happy that it's over. I will be pretty busy in the next couple of weeks, but I'm looking forward to a bit of a break in December and a fresh start in 2019. I will analyse everything from this season to come back stronger next year." Andrew Shovlin: "A great result for the team. We came here to win, so it's fantastic to have achieved that objective. It's been our toughest year for a long time, Ferrari pushed us hard in both championships and we've been running at 100% on both the chassis and engine sides almost since the word go, so it's a relief to get to the end and immensely satisfying that we've managed to hang onto both championships for another year. It was another great race from Lewis, he's not backed off one bit since winning the championship in Mexico and has worked as hard to win this race as every other race so well done on another deserved result. Valtteri had an issue during the race when he locked up at turn 5 and then lost positions. We'll have to a look into that to understand it as his race was all going to plan until that point and he was managing everything well. I'm sure Valtteri is looking forward to 2019, this year started well for him but he's had some cruel luck since Baku. He's been such an important part of the team through this year and we'll work hard over the next few months to make sure we can deliver him a reliable and fast car next year. I'd also like to thank Tony Ross for all his hard work over the last eight years. Tony will play a big part in our Formula E programme next year. He has contributed so much to the past five constructors championship, and Nico's driver's championship, so we will all be sad to see him go but happy we've had the chance to enjoy so much success together." Toto Wolff: "This has been an exceptional year for Mercedes motorsport - we've managed to clinch the title with Mick Schumacher in F3 and with George Russell in F2, we won the championships in DTM, in Esports and of course in Formula One. This year has been a highlight and I'm very happy we finished it on a high as well. It was a tough battle all season long and we had to push ourselves to the limit to win both championships. Lewis pushed to the very last race despite having won the drivers' title in Mexico. He's just so much a part of this team that the driver title alone felt incomplete to him; instead he wanted to deliver for the team, win the constructors' trophy and not take his foot of the throttle until the season was over. He drove another great race today and was in control on every single lap. Valtteri was struggling with the brakes today; we're still investigating the issue but we could see that the balance of his car was off. Valtteri had a tough season and I understand that he is disappointed - once the championship opportunity is taken away, it gets very difficult for a driver. He will take the winter to recharge his batteries and come back stronger next year." Max Verstappen (3rd): "It wasn't easy from the start, the engine had a bit of an issue which meant we lost a few places in the opening lap. It was a good launch but then I think it went into some sort of protection mode, we switched a sensor off and it seemed to be ok for the rest of the race. Once we had sorted the problem I was able to get on the attack and enjoy some really nice overtaking, especially passing Bottas. I don't think he saw me on the inside so we ended up touching, luckily we both escaped with no damage. It is hard to follow here so although I got close, I never really had a shot at getting past Seb. I struggled in the closing laps a bit because I couldn't see. My visor was covered in oil from the back of Pierre's car, if I wiped it, it made it worse, it was like driving through fog. Luckily the tyres held on until the end and I managed to finish my season with another podium. Everyone is ready for a bit of a break now, so we will take some time off once testing is complete, and come back refreshed and ready for a new challenge in 2019." Daniel Ricciardo (4th): "I would have loved to sign-off this chapter with a podium, so I can't be ecstatic with fourth and there is a little disappointment there. I led for a while which was fun but staying out put me out of touch with the leaders. I don't think we had much of a choice, maybe we could have pitted early and kept track position but nobody thought the supersofts would hold on like they did. The pace advantage after I pitted was strong but it fell away quite quickly and I couldn't make a big enough impact on Max or the leaders. My thoughts are still on the race but once I cool off I will reflect on the last five years with the Team. I would have loved a championship with them but Red Bull brought me my first pole, victory and podium. Everything I have done in F1 is down the them and I'm incredibly grateful for that. The moment before the race with everyone in the garage showing their love and appreciation was really cool and that's certainly something I will never forget. I thank the Team for the last five years and Red Bull for the last 10. I would have loved to drink out of my shoe and celebrate with the Team one last time, but now I close this chapter with thanks and love for everyone in the Red Bull family." Christian Horner, Sporting Director: "Third and fourth is a strong way to finish the season. Max recovered after his engine went into safety mode after getting very warm at the start of the race and fought his way back into position. Fortunately Hulkenberg wasn't injured in what looked like a nasty accident that brought out the safety car and thereafter both drivers had strong pace. 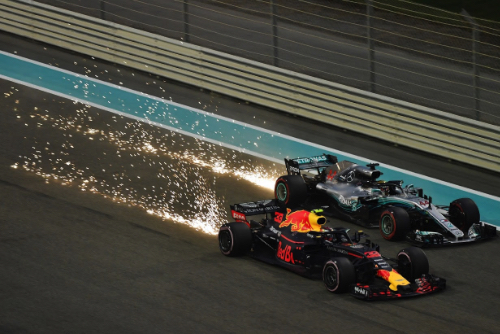 Daniel started on the harder tyre and was able to lead the race for 14 laps and then rejoined behind Max who was then able to pass Bottas and looked like he had very similar pace to Sebastian and Lewis ahead. Daniel was initially able to use the benefit of his new tyres and was able to close up, but unfortunately couldn't capitalise to be on the podium today. This race signals the end of five years with Daniel and we're sorry to see him leave. He's been a fantastic member of our team and we want to thank him for all that he has contributed. It also brings the end to our relationship with Renault, 59 victories 160 podiums and 8 world championships – it's been a long and successful partnership. But as one chapter closes, another one opens and we're already excited about 2019. It's been a great performance by the Team all season and I'm delighted that the pit stop crew won the DHL Fastest Pit Stop Award." Sergio Perez (8th): "Considering everything that has happened this weekend, I am pleased to finish inside the points. I've not been happy with the car and I've not had the pace we expected. We just never solved the balance issue and I think there could be some damage somewhere in the car. The start of the race was very important and after a strong first lap I was up inside the top ten. After that, the strategy worked as planned and my main competition was Leclerc. I was very close to him in the final few laps, but I just didn't have the pace to overtake him. I am pleased we could protect the seventh place in the team's championship and it was important to end the season with some points." Esteban Ocon (DNF, Engine): "It's a very frustrating way to end the season. Everything was going well, we had some fantastic battles and overtakes, and the pace we had was really good. We weren't on the best strategy because we had to start on the hypersoft tyres, but we had managed to recover well and we were looking good for a finish in the points. We did everything right as a team but sadly the car had an oil leak which forced us to retire. That's how racing is: days like these are disappointing, but they make you stronger. I am grateful for all the support I have received from the fans, people inside the sport and of course inside the team this season." Otmar Szafnauer, Chief Operating Officer: "The main priority today was to score points and confirm seventh place in the standings, which we delivered thanks to Sergio's run to eighth place. Starting on the ultrasoft tyre was definitely the optimal strategy and a strong opening lap was crucial to the final result. Esteban starred throughout the race with some great battles, but unfortunately his car suffered a loss of oil pressure and he had to retire. They both drove well tonight, as they have done all year, and we end the season on a positive note." Lance Stroll (13th): "I was very pleased with the start and the race in general and happy with my performance, but it was another one of those races where we just didn't have enough pace to pick up points. It was challenging, but I thought for the package we had it was a good race and I am happy to have been fighting with the McLarens and to have finished in front of one of them. We went really long in the first stint, which was good, but the wind picked up a little bit in the second stint and really impacted the performance of the car on the ultrasoft tyre, so I went downhill from there. Now I shall recharge my batteries as it has been a long year." Sergey Sirotkin (15th): "It was a really bad race. I didn't get the best start and straight away I lost a lot of ground and wasn't in the best position for the next sequences of corners. I had problems with the car overheating so for one third of the race I had to do massive cooling. It was such a painful race, such a painful stint. I was trying my best to cool it down as quick as I could but as other cars pitted and came out behind me, I tried to fight, protect and cool the car at the same time and it was a mess. I didn't enjoy it. It has been a very, very painful race. I really wanted to enjoy it and it's just so painful to finish the season like this." Paddy Lowe, Chief Technical Officer: "That brings an end to an incredibly long season and a very difficult one for the team, possibly the most difficult in its history. We see this as a year of transformation; the team has stuck together through some very difficult periods, and this will bring us back even stronger in the future. Thank you to Lance and Sergey for staying level and professional throughout, and especially to the team in the garage. It's the same hard work whether you're winning or losing, and they've stuck together and continued to win fastest pitstop awards in amongst our general poor car performance. It's a great team spirit and that will sustain us and support us in the winter to come back fighting next year." Carlos Sainz (6th): "Today was a really great result for us and this sixth place feels a bit like pay back for France and Mexico. We deserve it! I had a very strong pace all the way and it was a perfectly executed race. We achieved fourth in the Constructors' Championship and it is a very big result for us. This last race of the season firmly demonstrates all the progress made this year. I leave this team feeling very happy with what we've achieved and as a driver it makes me especially motivated. This was my last race with the Renault team and I thank everyone for the last year and a half. I'm not leaving the family and look forward to continue to see many of my Renault colleagues as I join McLaren." Nico Hulkenberg (DNF, Accident): "It was frustrating to be out of the race so early today and ultimately to finish the season this way having worked so hard with the team all weekend. It looks spectacular when cars flip but luckily it wasn't a high impact crash. It was a racing incident; I didn't see Grosjean – I thought that he went off the track and I took the apex, but the tyres touched and I flipped to go upside down. Overall it has been a good positive season for us with strong points. The team got fourth today in the Constructors' Championship and I got seventh in the Drivers'; on paper, the best season in my career. I am very pleased about the progress we have made this season. It's been great working with Carlos, he's been an excellent team-mate. I've enjoyed the season a lot and look forward to an even better one next year, also with Daniel joining the team. It will be very exciting." Cyril Abiteboul, Managing Director: "It's a great way to finish the season. P4 is where we wanted to be in the championship; it's a good result and a representation of the fantastic team effort on and off track and from both drivers. The race today is a good summary of our year. We had a disappointing qualifying and difficult first laps, but the team kept its head down and made excellent strategic choices in a race that went in our direction. We were able to take advantage of very strong race pace and managed the lead we had against the others to make sure we got to the end without any incidents. Obviously it was a shame to lose Nico early on, but he's been a huge contributing element to the season result that we secured today. I'd also like to thank Carlos for all he has done for the team since joining us. He's been a massive team player and wish him all the best as he joins our partner McLaren next year." Brendon Hartley (12th): "Unfortunately, my race was kind of over on the first lap. I didn't have anywhere to go with the crash into Turn 8 and I had to go off track to avoid the cars in front. I ran into some debris and damaged the front wing, so I had to stop on the first lap and then did a whole race on one set of tyres with the old spec front wing, which was always going to be an uphill battle. I managed the tyres well, but after the issue on lap one, P12 was pretty much the maximum we could manage. I've finished the year a lot stronger than I started it as the past few races have been great, however today didn't work out as planned. I'm happy with my progression throughout the season and I feel like I've come out of this year a stronger individual and racing driver." Pierre Gasly (DNF, Oil leak): "It has been a difficult weekend for us between qualifying and the race. A few laps to the end we had an issue where smoke started to come out of the car, I don't know exactly what happened, but until that point it was a really fun race and I was enjoying it. I started 17th and managed to move up the field to P10 and fight with Romain who finished P9, but unfortunately we ended the season the same way we started it, with a DNF. It was a bit emotional today because it was my last race with Toro Rosso. I've had a great season with them and Honda and I really wanted to finish well. Overall, it was a positive season from my side, I really enjoyed working with Toro Rosso and I will remember the good weekends we had together. I'm excited to start a new chapter with Red Bull Racing next year but, still, I will miss the guys here: they gave a lot to me and they're great people who have a lot of passion for what they do…it was a big pleasure to work with them!" Franz Tost, Team Principal: "Abu Dhabi was not the best weekend for Toro Rosso. Pierre had a very good start, he moved himself into 13th position and he improved throughout the race, showing good pace which could have brought him to finish in 10th position. Unfortunately, a few laps before the end he had to retire due to an issue we need to investigate further. This was Pierre's last race with us, he showed fantastic cooperation during the year and he improved a lot, showing he deserves his place in Aston Martin Red Bull Racing. I want to thank him for his great performance and I wish him all the best. As for Brendon, he started the race on the Ultrasofts as we decided to put him on an alternate strategy to Pierre. Unfortunately, he was caught in the middle of the first lap accident in Turn 8, so we had to call him in to change his front wing much earlier than planned. Then, he started to struggle with his rear tyres because of overheating and he ended up finishing in 12th position, out of the points. Of course it wasn't easy to come here from LMP1, it's always a challenge to get familiar with everything in Formula 1 and especially tyre management is a big task to cope with. He has been unlucky sometimes, but he has improved in the course of the season. It would have been great to finish the season in the points, also to reward the Team and Honda for the good job we've done together. Thanks to everyone at the track and at the factories in Italy, Japan and in the UK. We'll work hard to come back next year in the best possible way." Toyoharu Tanabe, Honda F1 Technical Director: "A very disappointing end to the season. Pierre had to retire, when running in the top ten, because of an oil leak, the cause of which we are currently investigating. Brendon fought hard but could not get into the points, after having to pit for a new nose following an incident on the opening lap. It has been a tough season, but we have learned a lot in our first year of working with Toro Rosso. We feel that over the course of the year, we have made a step forward in terms of both performance and reliability. However, there is still a lot of room for improvement, if we want to catch the frontrunners. We will be pushing hard over the winter, to have a good 2019 season, working with two teams. I wish to thank everyone at Honda and Toro Rosso, at the track, and back in the factories and of course the drivers for all their efforts this year. Thanks also to our fans: we hope to give them something more to cheer about next year." Romain Grosjean (9th): "It was complicated after the damage on the first lap. Obviously, there was (slight damage to) the front wing and maybe more. I'm glad Nico (Hulkenberg) was OK, though. The car was not easy to drive today, but I'm very happy that Kevin finished 10th today, so we both finished in the points. We've got such a great relationship in the team. We enjoy being together and, for the team to finish with double points, that's great. Obviously, you always want more, and I think today more was achievable. But considering the damage to the car, I'm quite happy with where we were." Kevin Magnussen (10th): "I'm very happy with the season. It's easy to forget how young this team is. We're only in our third year. We set a goal this season to take a step forward, which for us would have been seventh in the championship. But we've scored fifth comfortably. We've been strong all year. We challenged the likes of Renault and Force India all the way to the end. I'm very happy with that. The year has exceeded expectations." Guenther Steiner, Team Principal: "To get to the end of the season and score double points, it's good. It's ninth and 10th, but we couldn't catch anybody in the championship, anyway. It's a good result for the team to go into the short break. We can enjoy fifth place in the championship, which I think is a big achievement for a young team. We are very happy with that. We will be coming back strong next year." Fernando Alonso (11th): "It has been a very intense and good few days. I think I still need a couple of days to take everything in that I've lived and this weekend will always be in my heart. There have been so many nice things prepared for me from Formula 1, from my team and from the fans. I've been extremely busy, and didn't have the right time for myself to think about what was going on. Thanks also to Lewis and Sebastian for the nice in-lap all together. It was quite emotional. I have a lot of respect for them, they are great champions and I feel very privileged to have raced with them for most of my career. Today it was a good race, focussing on tyre management, fuel saving, and fighting for points until the last lap. All my career I have always been fighting, sometimes in competitive cars, sometimes not, but I've never given up. I'm proud of what I've achieved and for having raced for the best teams in the world. Thank you to my fans and all the people who have followed me over the past 18 years. I felt a lot of support and respect for me and this is something I take very seriously. I feel honoured. But, I'm not stopping racing. I love motorsport, so don't give up on me!" Stoffel Vandoorne (14th): "No points today to finish the year, but nevertheless it was a pretty good race. I had fun out there today – we knew it was going to be a tough one for us, especially without there being many incidents. We fought very hard and closed in on a couple of cars, and that was a really enjoyable part of the race. I fought like hell to keep cars behind! I'm happy with what we did this year with what we had. It's great to finish the season – today we gave everything and now I'm happy to see the chequered flag. Unfortunately, we weren't quick enough for points, but that was always going to be the case. I'm happy with how the race went, I gave it everything. It's time to celebrate a little bit and then time to move on to something fresh. I'm sure tomorrow my head will switch to my new challenge. I'm looking forward to it." Gil de Ferran, Sporting Director: "I want to take this opportunity to congratulate our drivers on a fighting and exciting performance – not only today but for the whole year. There was a lot of wheel-to-wheel action and I think overall we extracted everything we could. As I alluded to yesterday, the Abu Dhabi Grand Prix was very emotional for our whole team. Thank you, Stoffel, for all your dedication and hard work, and everything you've done for McLaren. Thank you, Fernando, for being an inspiration to everyone in this team and for your relentless pursuit of greatness, and many congratulations for an incredible and legendary career. I also want to thank our partners, sponsors and fans all over the globe. Your messages of encouragement are always well-received and effective! Finally, a huge thank you to all of the people who work at McLaren and enable us to be a part of one of the most elite events in the sports world, and represent ourselves with pride, commitment and passion. See you next year!" Charles Leclerc (7th): "I think that there was more in the race for us today, but we rounded off the season with a decent P7 and some more points. I would like to thank the Alfa Romeo Sauber F1 Team for this incredible year and everything they have taught me. It has been great to work together and to see all of the effort reflected in the progress we have made. We can all be proud to have been part of it, and I wish them all the best for the future." Marcus Ericsson (DNF, Mechanical): "The race did not end as I would have liked it to, and it is disappointing to have had to retire from it. We started on the hardest compound and I struggled with the balance a bit in the first stint. Just a few laps before I had to retire the car started feeling better and the pace was good. It would have been great to continue like that and score some more points today, but I am still happy with our performance. It has been a long year and I am very thankful for the hard work put in by the team. We should all be very proud of this season and the incredible progress we made. It has been my best season so far in Formula One and I will always remember it." Frederic Vasseur, Team Principal: "It is a great feeling to finish the championship in P8, especially if you look back at where we were last year and for the first two events. The improvements made have been huge, and this is thanks to the work done by the team at the track and in the factory. Our targets have risen, and the motivation for next year is high across all departments. A huge credit for our evolution goes to the drivers, who did a great job together and pushed each other to improve session after session and race after race. We thank Marcus and Charles for their great contribution and wish them both all the best for the future."